Some of the most dramatic rough-water film ever taken by Exploration Northwest shows the exciting and danger-filled work of the men who guide ships from the Pacific Ocean across one of the most turbulent and unpredictable stretches of water in the world -- the bar at the mouth of the Columbia River. Originally aired under the KOMO title "Captains of the Bar." Also, McCune summarizes the history of Astoria and Captain Flavel who established the bar pilots. Since 1892, the U.S. Coast Guard's lightship COLUMBIA was a beacon for mariners in darkness, fog and storm. Anchored 6 miles out from the mouth of the Columbia River, the ship alerted mariners to the hazards of the treacherous bar where the Columbia River meets the Pacific Ocean. Program includes footage of the RELIEF, which replaced the COLUMBIA during scheduled maintenance. 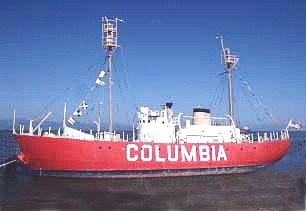 The COLUMBIA is now at the maritime museum in Astoria. Here's an excerpt from the show by writer/narrator Don McCune: "The COLUMBIA went on station in 1951. Standing alone with her feet in the sea, the COLUMBIA greets the groping fog, her ear-splitting blast audible for four miles. Approaching the bar, the weary navigator can see the staccato wink or slow beam. With its flash, the light identifies itself. The mariner relaxes; he now knows where he is. For almost a century, there has been a lightship here. The time will come when the COLUMBIA will no longer stand guard on 'calamity corner'. As the last of her kind, her days are numbered." Originally aired under the KOMO title "Lightship named COLUMBIA". The U. S. Coast Guard trains to rescue mariners in distress off the most-dangerous coastline in the United States...the Pacific Northwest coast near the mouth of the Columbia River out of Illwaco. 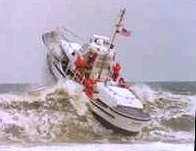 Dramatic film shows the Cape Disappointment Motor Life Boat School in action as they battle the sea. It includes slow-motion footage of the "self-righters," Coast Guard rescue boats that can withstand turning completely over! Dramatic film and narration won four Emmys!